Barbaro captures his spectacular victory and promising future; the heartbreaking events two weeks later at Pimlico; and the challenging medical procedures used to try and save the horse’s life. Despite the odds, the Jacksons remained amazingly dedicated and never relinquished hope, with the medical expertise of Dr. Dean Richardson enabling Barbaro to survive in the wake of his accident. On Jan. 29, 2007, however, Barbaro’s valiant struggle came to an end when he was euthanized after the pain from his injuries and subsequent surgeries became too great to sustain. This entry was posted on Friday, June 8th, 2007 at 3:47 am	and is filed under Other Pets, National Dog, Cat & Pet Info, Entertainment About Pets. You can follow any responses to this entry through the RSS 2.0 feed. Both comments and pings are currently closed. Hate to be a party-pooper but there is a very dark side to horse racing. Yes, a very, very dark side. I was a horse owner for years. I am so against racing. You wonder why so many race horses break down? They start racing them at 1 1/2 - 2 yrs old which is very bad for bones in which the growth plates haven’t closed yet. Also the drugs they are given. Responsible horse people don’t even back a horse until they are 3 yrs old and no high speeds or jumping until 4 yrs old. IMHO, racing is nothing but animal abuse. I agree, Cathy. Any time animals and money are involved, the animals lose. Contrast dog racing with the get-togethers where pet owners compete on obstacle courses. It boils down to objects used to make money versus family pets having fun with other family pets. Whoever said the love of money is the root of all evil was right on. I abhor the disgusting attempt to capitalize on the abuse that led to this beautiful animals death. Horse racing is animal abuse. I agree with all posters. Horse racing, dog racing, bullfighting, rodeos - all disgusting to me. Heck, I might as well throw in petting zoos and roadside zoos and circuses, etc..
We had a race track (standardbred) in the town I’m originally from. At two of barns where I boarded my horses, both barn owners refused to let any of the track people board their horses at their barns after how they saw them shooting drugs in their horses and the way they treated them. I was taking care of a friend’s horses and her boarder, a troubled young woman, was getting into racing because of the possible money. She and a guy had gone halves on a beautiful 2 year old thoroughbred filly. The sweet, thoroughly healthy filly was being boarded at the ranch. One weekend, the filly was entered into a race for ownership, and right before the finish line, dropped dead on the track. It was heartbreaking. I wasn’t there because I don’t support racing horses for money, but something injected into the filly, which never made sense because it shouldn’t have been done, was thought to have been injected with air bubbles that killed that amazingly sweet and beautiful horse soon after. Animals shouldn’t be used to make money. I hate dog racing, rodeos and circuses for the same reason. But it’s not Barbaro’s fault. 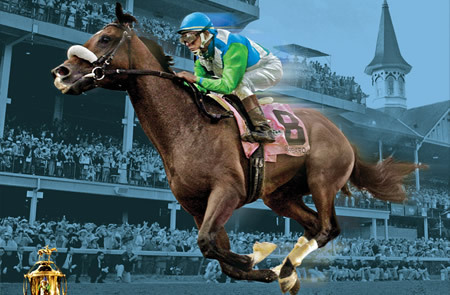 It’s like, by watching his specials and honoring Barbaro we can be there for him now. And his story is raising awareness. He won’t be a tragic, forgotten victim, but admired for his strength and grace in controversial circumstances, while enlightening more people on the issues of horse racing. It really hits home when people can identify the situation with a specific horse — put a face on the issue, you could say. Some people are okay with animals being used for sport or entertainment. Obviously Barbaro’s owners were. That aside, I still give them a lot of credit for all they did to help Barbaro after his accident. Laminitis/founder, especially with surgery involved, is very expensive to treat and would’ve sent most owners into immediate euthanization on the track. As I write this, CNN has a segment on about canned lion hunting in South Africa. Absolutely horrifying. So, add into the “animals making money for people” category, tame, farmed lions in safaris being shot to death in complete surprise against a metal fence for tens of thousands of dollars, by people like some guy from Boise, Idaho, calling it his vacation. Hunting vacation. “Hunting”. I thought it was inhumane not euthanizing him. When I saw what that poor horse was going though I cried. I was thoroughly disgusted. The only reason his owners kept him alive and spent so much money on him was for money. They wanted him for breeding which would have brought them BIG money. It’s always for the almighty buck.